Mormon Wookiee: #131: On the Lord's Errand: The Life of Thomas S. Monson. #131: On the Lord's Errand: The Life of Thomas S. Monson. This afternoon while Diane took a Sunday nap, I decided to start poking out the plastic holes from the new 320-slot movie case I bought from Amazon. I love to be organized, and I relished the thought of having every movie we own in proper genre order all in one big case (between the DVD and Blu-Ray versions of Star Wars alone, it totals 18 discs! Don't even get me started on the Lord of the Rings). The biggest movie case I could find. After poking out the first 6 plastic holes, I realized that this was going to be painfully boring. So, to make the poking more bearable, I decided to see what video features were on lds.org to help me pass the time. I stumbled across an hour-long video titled "On the Lord's Errand: The Life of Thomas S. Monson". 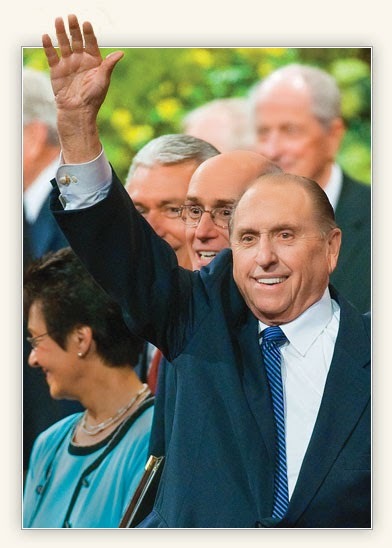 The video was produced in conjunction with President Monson being called as the sixteenth president of the Church in 2008. See below for the YouTube version direct link, as well. Well, after watching it, I knew I needed to blog about it. What a treat! As I watched, I felt the Holy Ghost multiple times as I learned about President Monson's remarkable life. So, whether you have plastic movie case holes that you need to poke out or if you just want to watch a truly uplifting movie, check it out. I think you'll like it just as much as I did.